For other uses, see New Scotland. New Scotland is a town in Albany County, New York, United States. The population was 8,648 at the 2010 census. 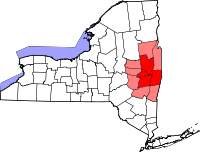 The town is southwest of Albany, New York, the state capital. New Scotland is centrally located in the county. The town was settled around 1660. New Scotland was founded in 1832 from the west part of the town of Bethlehem. The Bennett Hill Farm, Presbyterian Church in New Scotland and the New Scotland Cemetery, and Onesquethaw Valley Historic District are listed on the National Register of Historic Places. According to the United States Census Bureau, the town has a total area of 58.4 square miles (151 km2), of which, 58.1 square miles (150 km2) of it is land and 0.3 square miles (0.78 km2) of it (0.57%) is water. As of the census of 2000, there were 8,626 people, 3,341 households, and 2,509 families residing in the town. The population density was 148.6 people per square mile (57.4/km²). There were 3,470 housing units at an average density of 59.8 per square mile (23.1/km²). The racial makeup of the town was 98.17% White, 0.28% African American, 0.20% Native American, 0.50% Asian, 0.20% from other races, and 0.66% from two or more races. Hispanic or Latino of any race were 0.87% of the population. There were 3,341 households out of which 33.7% had children under the age of 18 living with them, 62.6% were married couples living together, 9.4% had a female householder with no husband present, and 24.9% were non-families. 20.1% of all households were made up of individuals and 7.2% had someone living alone who was 65 years of age or older. The average household size was 2.58 and the average family size was 2.98. In the town, the population was spread out with 24.9% under the age of 18, 5.7% from 18 to 24, 26.6% from 25 to 44, 29.6% from 45 to 64, and 13.2% who were 65 years of age or older. The median age was 41 years. For every 100 females, there were 95.8 males. For every 100 females age 18 and over, there were 93.4 males. The median income for a household in the town was $58,956, and the median income for a family was $65,753. Males had a median income of $44,138 versus $33,941 for females. The per capita income for the town was $29,231. About 2.5% of families and 4.1% of the population were below the poverty line, including 4.6% of those under age 18 and 4.0% of those age 65 or over. Camp Pinnacle – A location in the northwest part of the town. Clarksville – A hamlet in the southwest part of the town on Route 443. Feura Bush – A hamlet in the southeast part of the town, south of Unionville on County Rt. 32. Meads Corner – A location southeast of Clarksville. New Salem – A hamlet west of New Scotland village. New Scotland – The hamlet of New Scotland is south of Voorheesville. Tarrytown (also "Onesquethaw") – A hamlet south of Clarksville. Vly Creek Reservoir – A reservoir south of New Salem, now owned by the Town of Bethlehem. Voorheesville – An incorporated village in the northern part of the town. Wolf Hill – A hamlet at the west town line. ^ "National Register of Historic Places". WEEKLY LIST OF ACTIONS TAKEN ON PROPERTIES: 8/30/10 THROUGH 9/03/10. National Park Service. September 11, 2010. Wikimedia Commons has media related to New Scotland, New York. This page was last edited on 4 December 2018, at 17:30 (UTC).